GARDENA, Calif. – April 5, 2016 –When veteran NASCAR driver Aric Almirola takes the wheel of the Biagi-DenBeste Racing No. 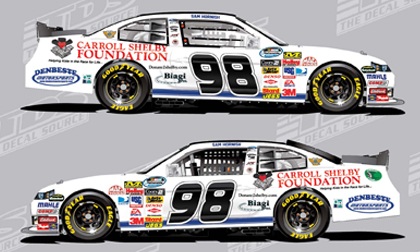 98 Ford Mustang at Texas Motor Speedway this weekend, he will also represent the Carroll Shelby Foundation at the O’Reilly Auto Parts 300 on Friday April, 8. For the Lone Star race only, the Mustang will wear the Carroll Shelby Foundation and Carroll Shelby Automotive Technology Program logos to raise awareness for the two non-profit organizations. The Carroll Shelby Foundation was created to provide medical assistance, as well as educational opportunities through automotive and other training programs. It also benefits the Shelby Automotive Museum in Southern California. For many years, Bill DenBeste and Carroll Shelby worked and enjoyed motorsports together. Carroll played an important role in shaping DenBeste’s pursuits and encouraged him to open DenBeste Motorsports, the largest Shelby Cobra dealer in the world. Heading into the sixth race of the NASCAR XFINITY series, the No. 98 Mustang will be piloted by veteran NASCAR driver Aric Almirola. Joining Biagi-DenBeste Racing are members of the Shelby family, as well as executives from the Carroll Shelby Foundation. The Carroll Shelby Foundation was created by legendary racer and automotive manufacturer Carroll Shelby. Headquartered in Gardena, Calif., the Foundation is dedicated to providing medical assistance for those in need, including children, educational opportunities for young people through automotive and other training programs and benefitting the Shelby Automotive Museum. For more information, visit http://www.shelby.com/?topic=csf.